PETA is messin’ with one of the joys in life. A 21yr. old named CJ Wickersham was spear fishing with his buddies in September near Anna Maria Island when a Bull shark took a chunk out of his thigh. The shark slammed those teeth together so hard CJ’s bone was sticking through a 15-inch gash. 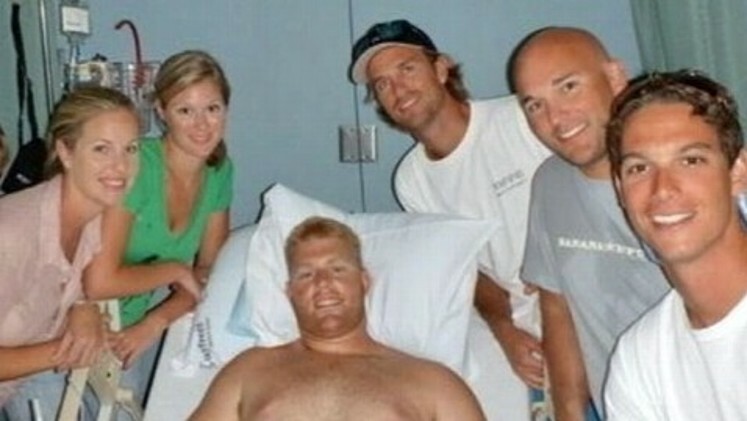 Blood was everywhere, yet it didn’t stop his friends from jumping into the water to save CJ. It took 700 to 800 stitches to close the monstrous wound in CJ’s left thigh. I listened to his sister Christy (?) on “Maverick in the Morning” and she said her brother will be fine. So long as he doesn’t fall prey to PETA. Wasn’t long after his attack this ad appeared. PETA also wants us to know the University of Florida’s International Shark Attack File report: sharks kill an average of 5 people per year; fishing fleets kill nearly 70 million sharks per year; unprovoked shark attacks in Florida since 1882 have resulted in 11 fatalities. Here’s my problem. Do you suppose there is anyone among all the PETA people and their families who fish? Do you think sharks know where two innocent women fish on the banks of the Indian River? This entry was posted in Environment and tagged Anna Maria Island, Ashley Byrne, Bull shark, CJ Wickersham, Florida, Ohio, People for the Ethical Treatment of Animals, University of Florida. Bookmark the permalink.